Azumarill in game: 755 Who? Important notice! Pokemon Azumarill is a fictional character of humans. Azumarill (Japanese: マリルリ Marilli) is a dual-type Water/Fairy Pokémon introduced in Generation II. Prior to Generation VI, it was a pure Water-type Pokémon. It evolves from Marill starting at level 18. It is the final form of Azurill. 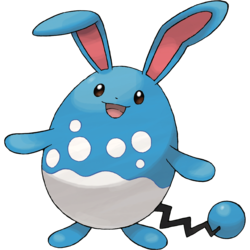 Azumarill is a blue, bipedal Pokémon that has an ovoid body. The lower half of its body is white with a white, bubble-like pattern above it, which helps to camouflage it in water. It has elongated, rabbit-like ears with red insides and circular eyes. When in the water, it rolls up its ears to prevent the insides from becoming wet. Its arms and feet are short with rounded ends and no discernible digits. It has a black zigzagging tail with a blue, bubble-like tip. 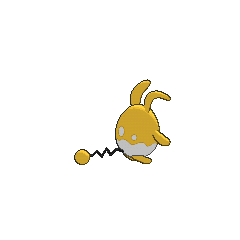 Azumarill has highly developed hearing that allows it to hear distances, even when it is underwater. By keeping still and listening closely, it can identity prey even in wild, fast-moving rivers. If Azumarill spots a drowning Pokémon, it will make a balloon out of air. It lives in rivers and lakes, and can live in the water all day long. Azumarill first appeared in Love, Totodile Style. A female one was used in a circus. Ash's Totodile had a crush on her. Of course, the Azumarill already had a boyfriend of sorts: a Golduck. An Azumarill is one of the friends of the Pichu Brothers. It has appeared in Trouble in Big Town, Of Meowth and Pokémon (Part 1), Big Meowth, Little Dreams, and Pichu Bros. in Party Panic. It also made a cameo appearance in Giratina and the Sky Warrior. Jackson used an Azumarill against Ash in the Silver Conference in Tie One On!. Paul used an Azumarill in his battle at the Oreburgh Gym in Shapes of Things to Come. However, it lost and Paul gave it away to a passing Trainer. An Azumarill appeared in PK13, in which it was about to perform a song in the Summer Festival before a wild Skarmory kidnapped it. 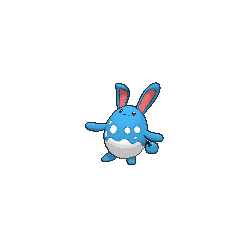 An Azumarill appeared in The Pirates of Decolore!. An Azumarill was one of the Pokémon living at Temacu's father's lab in The Heartbreak of Brock. An Azumarill competed alongside its Trainer in the Pokémon Balloon Race in The Big Balloon Blow-Up. An Azumarill appeared in Dueling Heroes. An Azumarill was seen at a Pokémon Center in The Legend of Thunder!. An Azumarill was used by a competitor in the Tour de Alto Mare in Pokémon Heroes: Latios & Latias. A star Azumarill was brought to sing to all the Pokémon at Pikachu's Summer Festival. An Azumarill appeared in A Ruin with a View. A Trainer's Azumarill appeared in Off the Unbeaten Path participating in the Pokémon Orienteering. An Azumarill along with an Azurill and a Marill made a cameo in the beginning of Pokémon Ranger and the Temple of the Sea under the control of Solana's Capture Stylerwhere they put out a fire in a forest. An Azumarill also appears in The Rise of Darkrai, along with a Marill and Azurill. 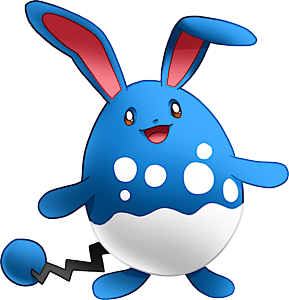 An Azumarill is used by a student of Pokémon Summer Academy in the second leg of the Pokémon Triathlon in One Team, Two Team, Red Team, Blue Team!. An Azumarill also appeared in To Thine Own Pokémon Be True!. An Azumarill made a brief appearance under the ownership of a Trainer in the Lily of the Valley Conference in An Old Family Blend!. An Azumarill appeared in Zoroark: Master of Illusions. An Azumarill appeared in Mewtwo — Prologue to Awakening. Two Azumarill appeared in Kalos, Where Dreams and Adventures Begin!. 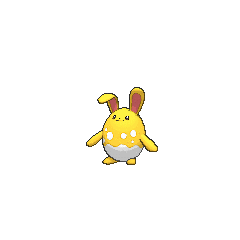 An Azumarill appeared in Lumiose City Pursuit!. A Trainer's Azumarill appeared in Mega Evolution Special III. An Azumarill appeared in A Fashionable Battle!, under the ownership of a Furisode Girl. 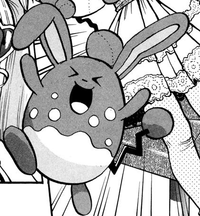 An Azumarill appeared in Hoopa — The Mischief Pokémon. Three Azumarill appeared in Pikachu and the Pokémon Music Squad. A Trainer's Azumarill appeared in A Performance Pop Quiz!. EP153 Azumarill Ash's Pokédex Azumarill, the Aqua Rabbit Pokémon. The evolved form of Marill. This Pokémon uses its large, highly developed ears to hear great distances, even underwater. DP015 Azumarill Dawn's Pokédex Azumarill, the Aqua Rabbit Pokémon. Azumarill lives in rivers and lakes, and while in water its body color and pattern confuses its enemies. Madam Azumarill is a ninja master and Apricot and Marimaru's teacher in the ninja arts. She is also Marimaru's mother. Azumarill debuts in Forretress of Solitude where it was used to battle Red in his aptitude test to be the Gym Leader of Viridian City. Azumarill appears in Absolutely Azumarill, being chased by Crystal's mother. When her mother asks her to demonstrate her capturing prowess, Crystal fails, as she has done so since her failure to capture Suicune, eliciting her mother's concern over her sudden loss of her ability. Crystal's mom later appears with an Azumarill in the HeartGold & SoulSilver chapter, but it is not known if it is related to the other one. Matt uses an Azumarill in VS. Azumarill I and VS. Azumarill II in an attempt to drown both Sapphire and Flannery in the cable car of Mt. Chimney. In Weavile Wobbles But It Won't Fall Down, a Trainer at the Safari Zone owns one. By keeping still and listening intently, it can tell what is in even wild, fast-moving rivers. When it plays in water, it rolls up its elongated ears to prevent their insides from getting wet. Azumarill's long ears are indispensable sensors. By focusing its hearing, this Pokémon can identify what kinds of prey are around, even in rough and fast-running rivers. Azumarill can make balloons out of air. It makes these air balloons if it spots a drowning Pokémon. The air balloons enable the Pokémon in trouble to breathe. It lives in water virtually all day long. Its body color and pattern act as camouflage that makes it tough for enemies to spot in water. By keeping still and listening intently, it can even tell what is in wild, fast-moving rivers. It lives in rivers and lakes. In water, its coloring and patterns trick the vision of foes. It can spend all day in water, since it can inhale and store a large volume of air. Its long ears are superb sensors. It can distinguish the movements of things in water and tell what they are. If this Pokémon has Thick Fat, the effectiveness of Fire-type moves is ¼× and the effectiveness of Ice-type moves is ¼×. Due to the conversion to Fairy-type , the effectiveness of Steel-type moves was ½×, and Dragon-type , Dark-type , Fighting-type , Bug-type and Poison-type moves were 1×. prior to Generation VI. 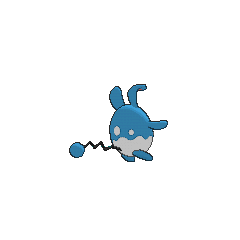 Moves marked with a dagger (†) can only be bred onto Azumarill if it hatches as an Azurill, and cannot be obtained otherwise. Moves marked with a superscript game abbreviation can only be bred onto Azumarill in that game. 51%-100% HP My ears can pick up the sound of a pin dropping far away! 26%-50% HP Why is my health down to half already? Level up Yep! There's my level! I'll pick up the pace! For other sprites and images, please see Azumarill images on the Bulbagarden Archives. In Generation V, Azumarill and Marill are the only Pokémon that can have the Electric type as their sole weakness. This is because of their Hidden Ability Sap Sipper. Azumarill is the only member of its evolutionary line that was not publicly revealed prior to the generation it debuted in. It may be based on a combination of a rabbit and a beach ball or possibly a personal flotation device or lifebuoy. It could be also possibly based on the swamp rabbits, which have a strong preference for wet areas (such as cypress swamps, marshland, floodplain, and river tributaries) and that will take to the water and swim. Azumarill's water-like splash pattern may reflect from the camouflage of Countershading of aquatic animals such as sharks and penguins, being that they have a dark coloration on top to match the dark water underneath and a white coloration on their under to match the sunlight from above. Marilli may be a combination of 丸い marui (round or circular) or 鞠 mari (ball) and 瑠璃 ruri (lapis lazuli).